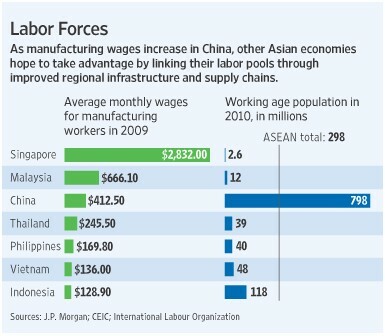 But Southeast Asia also faces enormous hurdles, including underdeveloped legal systems and problems with corruption. There is also the possibility that costs could spiral more than expected as workers learn more about wage gains in China and press for raises. Ford Motor Co. said it will build a $450 million car factory in Thailand, its first wholly owned plant in the country, undeterred by fatal anti-government protests in Bangkok earlier this year. Then last month GM announced a new USD500 million* diesel engine plant which will reportedly double the number of workers. So Thailand’s Finance Minister, Korn Chatikavanij, has come up with a very big idea, albeit a simple one – raise workers’ salaries. ”What’s the cost to the country to significantly increase this minimum wage?” he posits during our recent interview. ‘The most significant thing about the Foxconn matter was that overnight the owner was able to double salaries. That means he could afford to do it,” he says. Korn’s thinking betrays not just his own government’s immediate dilemma but a longer-term Asian leadership conundrum – how to confront unexpected political and economic challenges as working-class aspirations and education rise. BP: Interesting. Not sure that a significant increase in the minimum wage is the best solution – PPT reports “[i]n the Thai press he said something about a big rise and then holding the wage fixed for five years”. Wouldn’t 10 percent increases per year for the next 20 years be a better solution and provide an opportunity for businesses to adjust than a sudden big rise then fixing wages? *yes, this should have read USD500 million and not USD500.